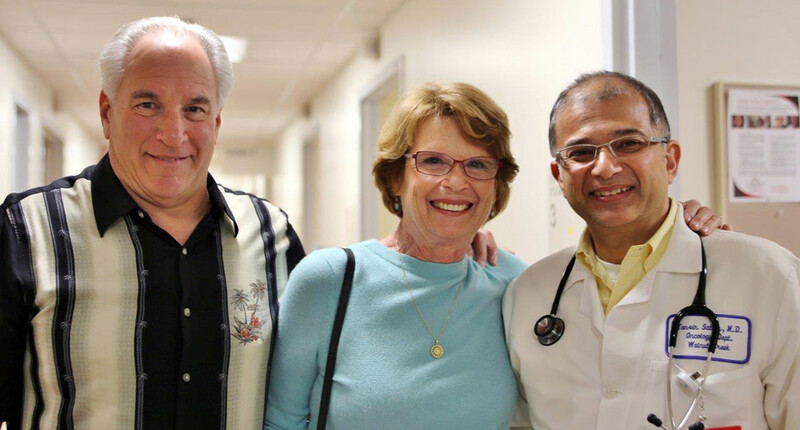 Kaiser Permanente member Sheila Zoerner with her husband Charlie, left, and Dr. Tanvir Sattar. A breast cancer diagnosis can feel overwhelming for a patient, not to mention the array of visits that follow on the path to treatment. 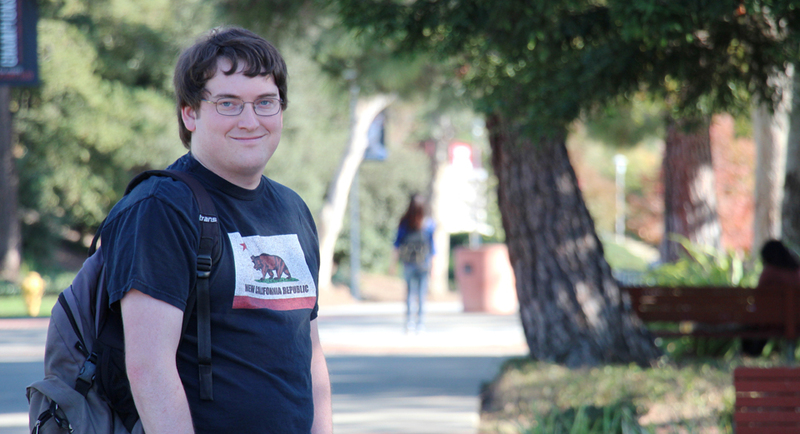 But there is strength in numbers when it comes to caring for this condition. Studies have shown that a multidisciplinary approach to breast cancer treatment can provide improved outcomes while helping patients to feel more at ease. 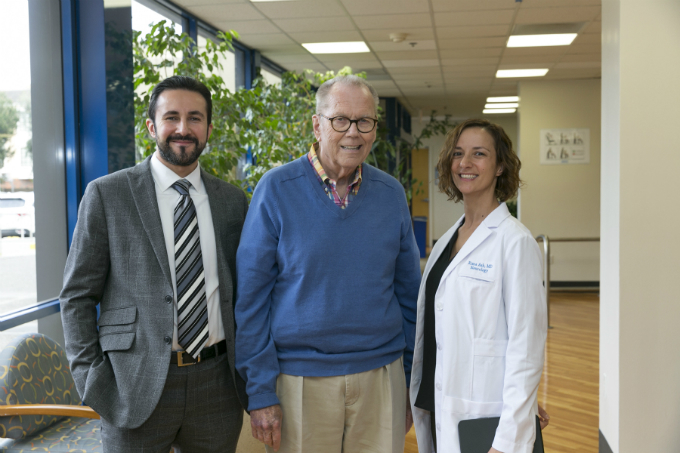 Multidisciplinary Breast Care Clinics, which have opened over the last few years at several Kaiser Permanente facilities, allow patients to receive coordinated care from a team of specialists that include surgeons, medical oncologists, and radiation oncologists. Working with the physicians of the Permanente Medical Groups, the organization has a unique integrated care model that makes these multidisciplinary clinics successful. Dr. Moran explains that Kaiser Permanente’s integrated system and electronic medical record make it simple for specialists to get the latest information on a patient’s care. With the Multidisciplinary Breast Care Clinic, specialty physicians gather together for a tumor board to discuss cases and develop the best care plan for a patient. In a fee-for-service environment, Dr. Moran notes, there is a lack of incentive for specialists to work together, with increased revenue coming to physicians who provide more of the care for the patient . A few of our Multidisciplinary Breast Care Clinics across the country have also received accreditation from the National Accreditation Program for Breast Centers (NAPBC), a quality program of the American College of Surgeons. For example, the Multidisciplinary Breast Care Clinic at Kaiser Permanente’s Tysons Corner Medical Center received a three-year accreditation last year – the first Kaiser Permanente facility in the region to receive this designation. The Southeast Permanente Medical Group, which serves Kaiser Permanente members in the Georgia Region, has a Breast Care Center at our Glenlake Medical Center – the first in the area to feature a multidisciplinary breast care team. Members who are recently diagnosed with breast cancer are contacted by a member of the Breast Cancer Center and offered an appointment with the team. The appointment will include a coordinated series of same-day visits with a breast surgeon, medical oncologist, and radiation oncologist, as well as a group consult with physicians from each specialty. After all the physicians have examined the patient, they meet with the patient and family members to provide an assessment based on their individual expertise and in consultation with each other. This ensures that everyone involved in the care of the patient understands the treatment plan and helps avoid the need for the patient to interpret and decide based on differing viewpoints. In Northern California, Kaiser Permanente member Sheila Zoerner was diagnosed with an aggressive, metastatic breast cancer in April 2010. She quickly received an appointment at our multidisciplinary clinic where she met with her surgeon, radiologist, plastic surgeon, clinical nurse, nutritionist, and others. But Dr. Moran notes that this isn’t for everyone. A nurse navigator discusses with a member who has been diagnosed with breast cancer about the option of the multidisciplinary clinic, but it’s never forced on the patient. For those who do choose to be treated through the Multidisciplinary Breast Care Clinic, Dr. Moran says, they’ve found the experience to be positive. At Northwest Permanente, the Breast Cancer Task Force has worked to ensure consistency in experience for the patient – even making sure wording for standardized conversations are available to care team members through the electronic health record. The multidisciplinary approach also helps to improve the expertise of our specialists. By working together, the physicians can challenge each other and learn from each other in their effort to determine the best course of treatment. View the following video to learn about the Breast Cancer Clinic in our Georgia Region with care provided by The Southeast Permanente Medical Group. Watch Timothy Kim, MD, discuss how Kaiser Permanente offers excellent care for kidney, bladder, and prostate cancer using advanced techniques. Permanente neurologists implant the St. Jude's device to prompt deep brain stimulation in order to manage tremors in a patient with Parkinson's disease.